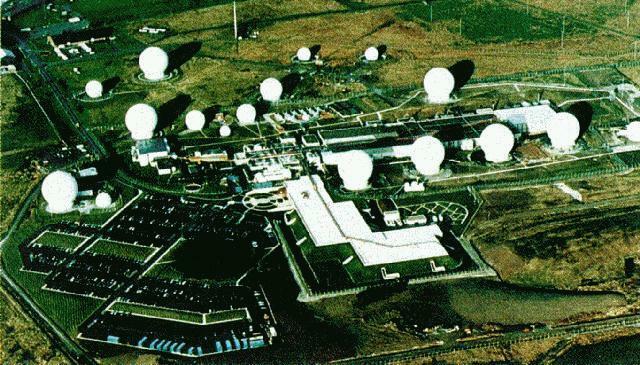 ECHELON intercept station at Menwith Hill, England. In the days of the cold war, ECHELON's primary purpose was to keep an eye on the U.S.S.R. In the wake of the fall of the U.S.S.R. ECHELON justifies it's continued multi-billion dollar expense with the claim that it is being used to fight "terrorism", the catch-all phrase used to justify any and all abuses of civil rights. Here is the article that ran in the London Telegraph. the crucial hub at Menwith Hill in the North York moors in the UK." using artificial intelligence aids like MEMEX to find key words". containing key words of interest to each country. electronic communications has become endemic throughout the world. future of civil liberties in Europe. debating issues such as free movement, immigration and drugs. corresponding strengthening of civil liberties." accessible to US intelligence agencies." and Britain, one US institution was singled out for special attention. activities of the US government. Government invoked secrecy rules. It has been the same for 40 years. right to know at some level. At the moment that's nowhere". permission. Information for webmasters linking to Electronic Telegraph. NEW ZEALAND TO JOIN A NEW AND HIGHLY SECRET GLOBAL INTELLIGENCE SYSTEM. OF THE WORLD'S TELEPHONE, E-MAIL, AND TELEX COMMUNICATIONS. kept secret elsewhere. Of these, by far the most important is ECHELON. organizations, businesses, and individuals in virtually every country. sometimes within) countries anywhere in the world. intercept a large proportion of the communications on the planet. finds intelligence needles in telecommunications haystacks. analyzed the intercept from its own stations. search lists for the NSA, GCHQ, DSD, and CSE in addition to its own. overtly NSA-run bases located on their soil. intercept the communications carried by the Intelsats. NSA provides the codebreaking programs). satellites); Bad Aibling in Germany; and Misawa in northern Japan. telecommunications systems is the final element of the ECHELON system. privilege, they allow interception in the heart of the target country. the world's communications that cross their territories. Dictionary computers connected into ECHELON. for the massive network will be the NSA headquarters at Fort Meade. messages about distribution of encryption technology. into as they wish. It is much more controlled. diplomatic, Russian Antarctic activities, and so on. businesses, organizations, and government offices that are targets. easily recognized by the Dictionary computers. have been tagged with that number. which case they'll do it for you." system   the agency that set it up. What is the system used for? these are now the primary concerns of organizations such as NSA. governments are concerned about can become a target. four-digit code covering Third World aid be placed. analyze large quantities of telephone conversations. "listen" to telephone calls and recognize when keywords are spoken. accents we encounter, so too, according to Frost, can these computers. stations for the other agencies. the priorities continue to come from the US, too. readers could feel confident that they were getting close to the truth. about UKUSA and its systems such as ECHELON  will help lead to change. Chomsky; targeted by the CIA.